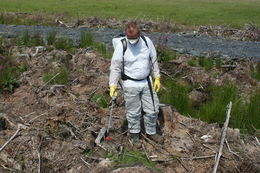 The need to treat newly planted Sitka against Large Pine Weevil with Forester was the trigger point that resulted in the acquisition of a Micron AutoDos metered-dose sprayer. Research identified the AutoDos as the only high quality sprayer capable of administering the recommended dose of 10-20ml of diluted liquid in a precise and repeatable fashion, thus offering considerable chemical savings. 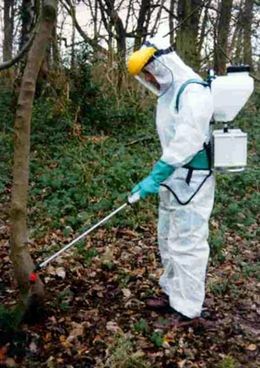 Based on 11,500 trees that needed treatment twice over a 2 year period, the savings amounted to about £400 by keeping the dose to the minimum recommended. 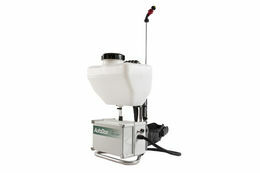 The sprayer has a robust construction and scores well from and ergonomic point of view. In terms of speed, the sprayer probably does the job faster than most conventional sprayers. The AutoDos is a high quality metered dose spray applicator developed for the professional forester, horticulturalist or amenity user. The sprayer is electrically operated from a small rechargeable 12v DC battery with an electronically controlled pump delivering a precise and repeatable metered volume of spray liquid. This allows the professional user to accurately apply herbicides, insecticides, growth regulators or plant nutrients and to effortlessly treat several thousand plants or trees in a single day. The AutoDos is supplied with a ten litre backpack, with large filling aperture and filter and supported on an ergonomically designed lightweight aluminium back frame with metal lance and integral thumb switch. The sprayer is supplied with a battery recharger. The battery, electronic controller and pump are housed in a tough hermetically sealed GRP case for superior durability. The combination of nozzle tip and pressure control flow valve allows the user to set a measured and repeatable spray volume. The sprayer can also be operated in continuos mode for band applications.